For temporary relief of nasal congestion due to a cold; associated with sinusitis; due to hay fever or other upper respiratory allergies; temporarily relieves sinus congestion and pressure; shrinks swollen membranes so you can breathe more freely. AllegroMedical.com presents The sunmark Nasal Spray. 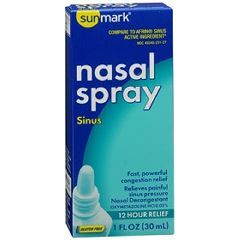 sunmark Sinus Nasal Spray. 1 fl. oz. For temporary relief of nasal congestion due to a cold; associated with sinusitis; due to hay fever or other upper respiratory allergies; temporarily relieves sinus congestion and pressure; shrinks swollen membranes so you can breathe more freely. Compares to Afrin®. Not made with natural rubber latex. Packaged: 72 Per Case. Afrin is a registered trademark of Schering-Plough HealthCare Products Inc.